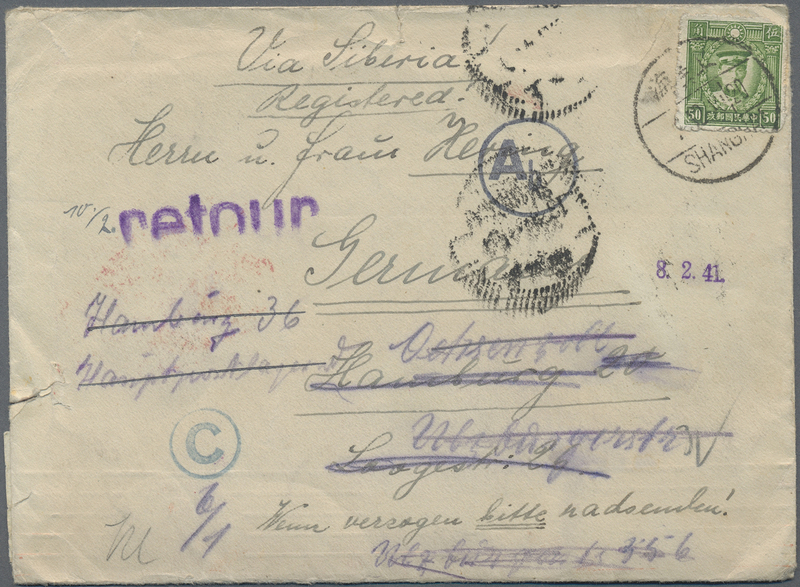 29458 Brief (cover) Ansichtskarte (Picture postcard) Ganzsache (Complete) 1923/48,used in Tsingtau: covers (prewar 5/occupation 4/postwar 5), used stationery (2), ppc of catholic orphan home (1). Mostly used foreign. Total 17 items. 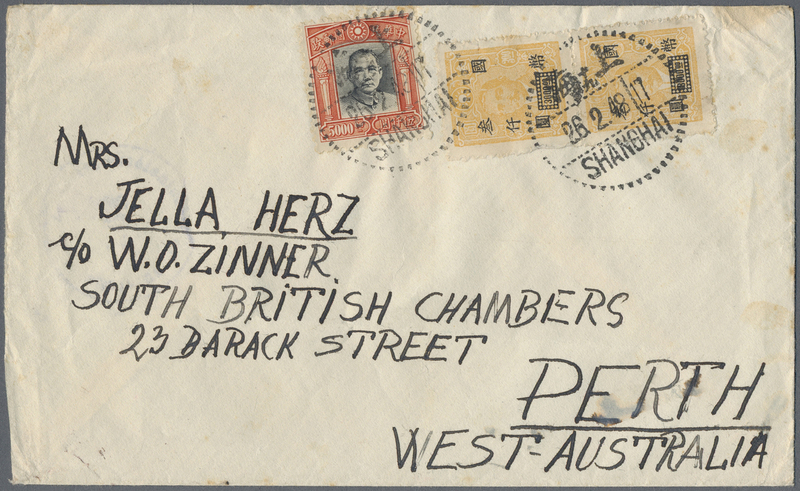 29461 postfrisch (never hinged) ** ungebraucht (hinged) * gestempelt (marked) FDC 1930/1979 (ca. 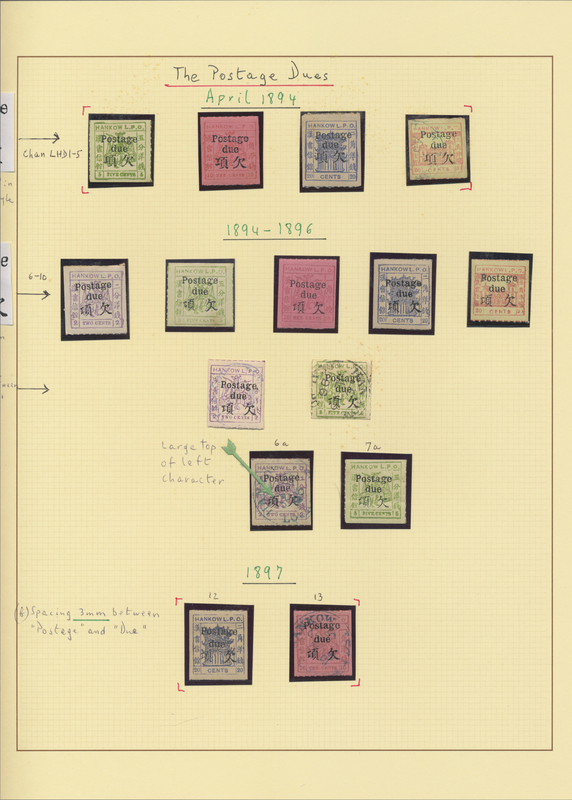 ), interesting accumulation in a small stockbook and on stockcards, hundreds of stamps, mostly unused mint and to the year 1949. 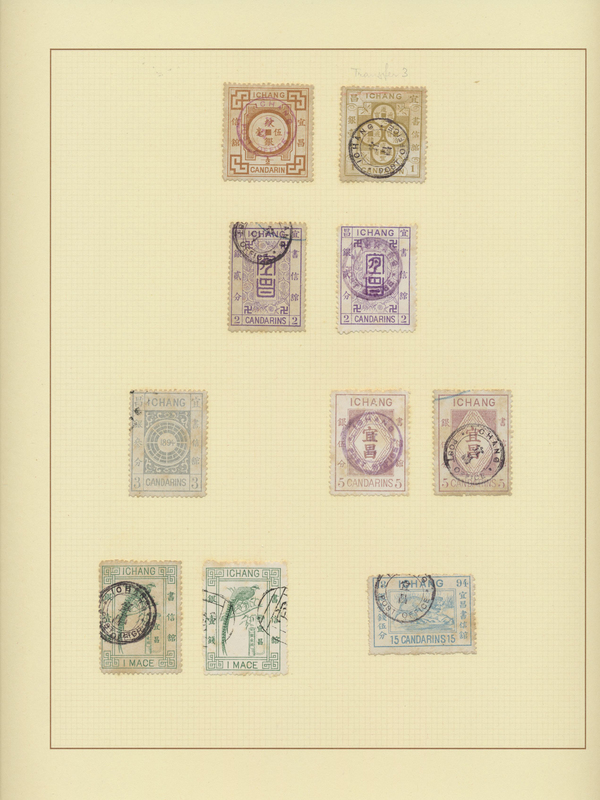 Some issues of the People´s Republic mint and used as well as four covers. This lot needs careful checking. 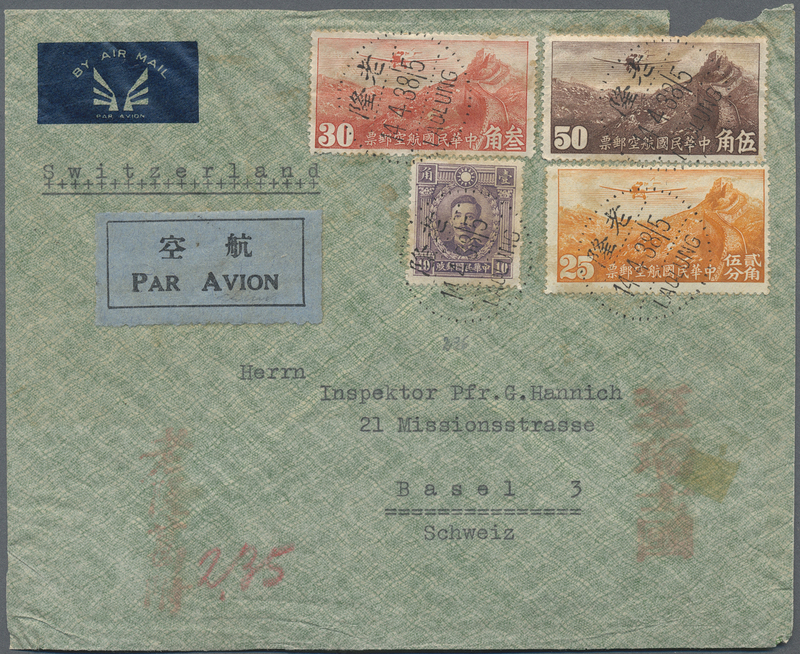 29462 1930/40s, many overprints on Martyr issues housed on album pages through to Taiwan 1950s onwards with many complete sets, as well as Northeastern provinces, postage dues, airposts, etc. 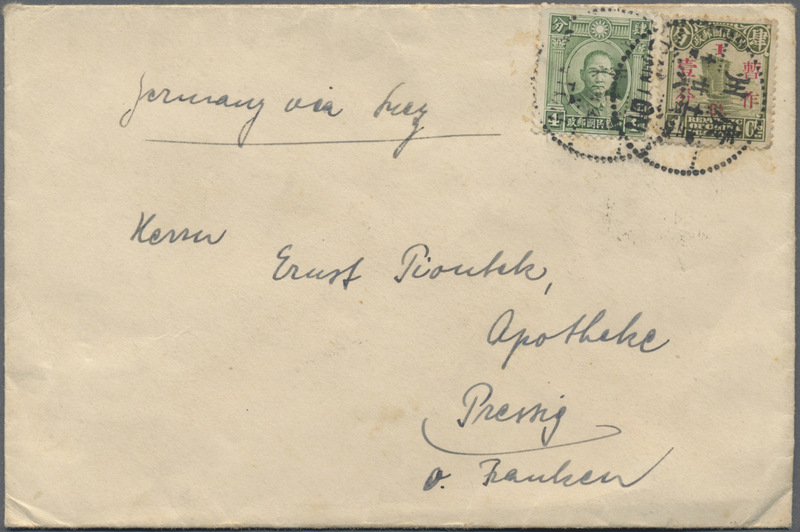 29463 ungebraucht (hinged) * gestempelt (marked) Brief (cover) 236/45-ex 1931/32, Dr. Sun definitives, specialized mint/used on pages inc. perfins and three covers. 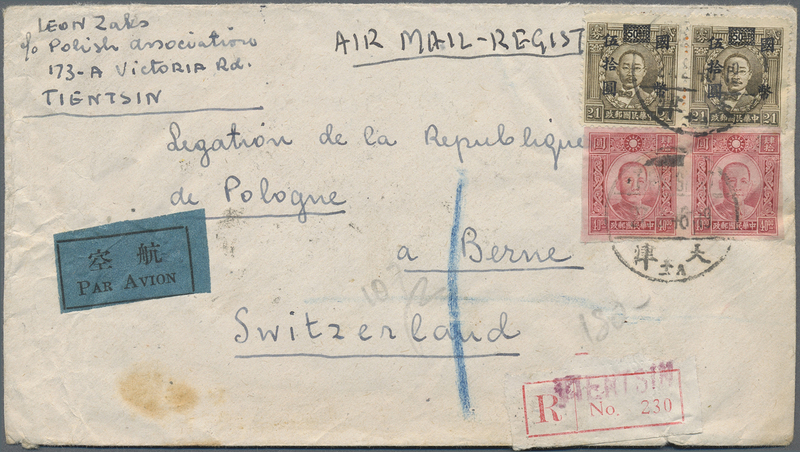 29464 postfrisch (never hinged) ** gestempelt (marked) 4er (Block) Brief (cover) 262/271-ex, 359/378- 1932/41, Great Wall airmails, mint never hinged MNH blocks-4 or pairs and used singles inc. variation mounted on pages. 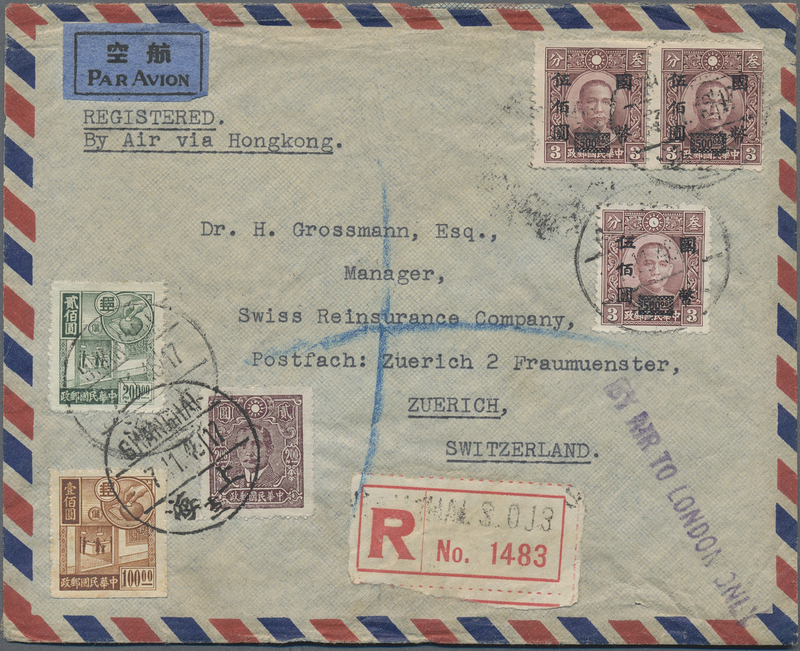 Also covers (4): 60 C. single used Canton 1935 to Loyang, 1937 FFC Eurasia Peiping-HK-Peiping with contents, 1939 airmails (2) to Vienna/Germany via HK and Athens (70 C./75 C. rates). 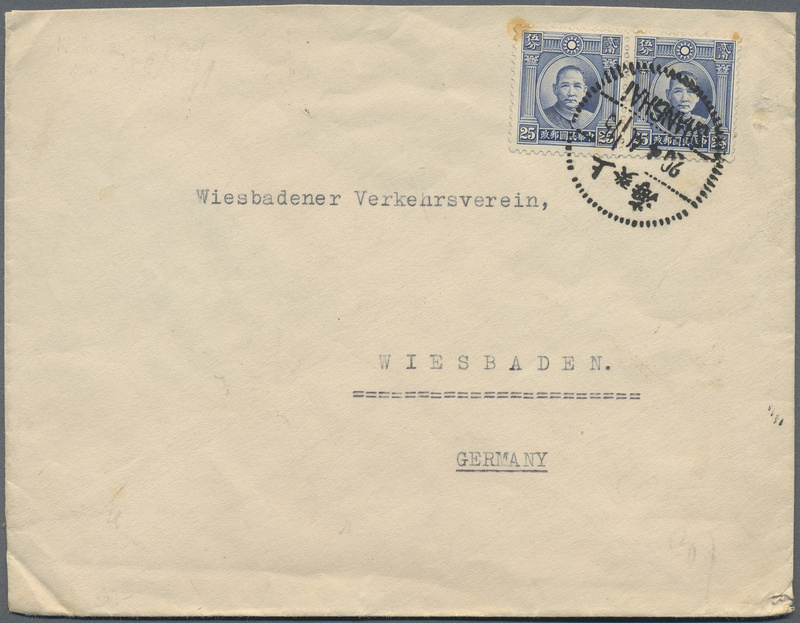 29465 postfrisch (never hinged) ** ungebraucht ohne Gummi (unused without gum) (*) gestempelt (marked) 4er (Block) Brief (cover) 1932/41, martyrs inc. HK printings unwmkd./wmkd. 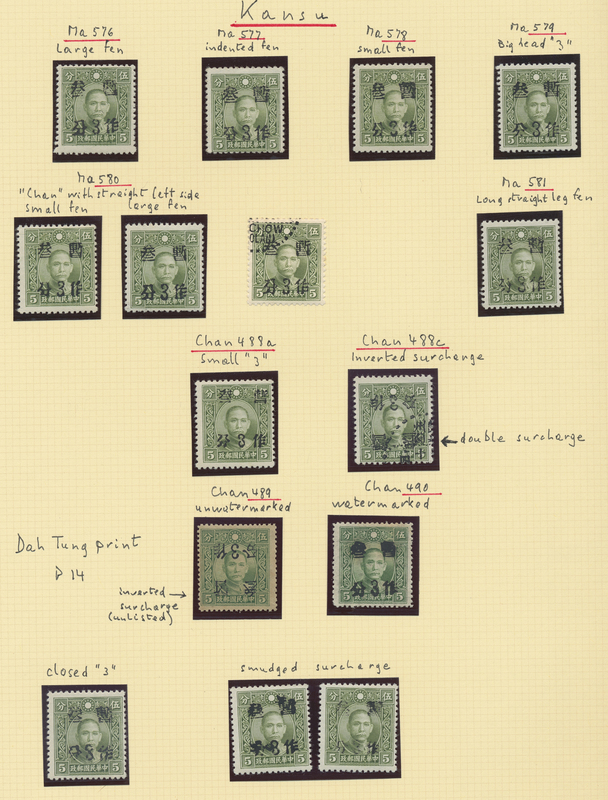 and SYS 1938/41 Chung Hwa, Dah Tung, Commercial Press and NY printings mint/used specialized on pages, inc. blocks-4 MNH, pairs, varieties, horiz. imperf. 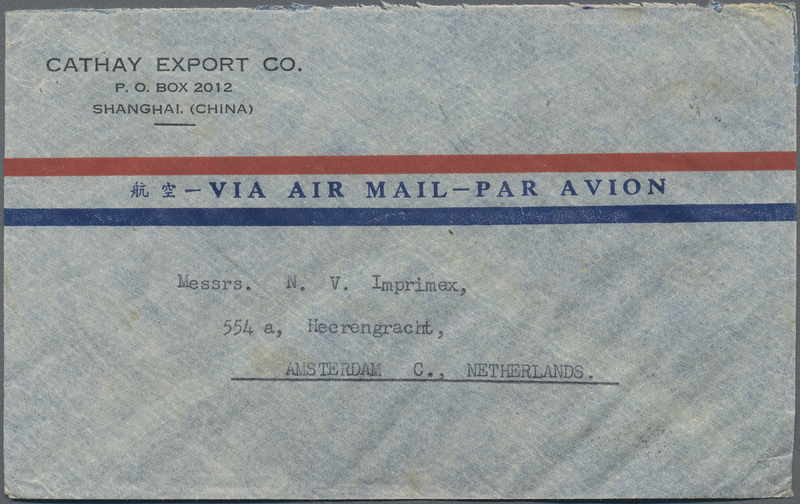 pairs 3 C./30 C.-exsome perfins and temporary p.o. 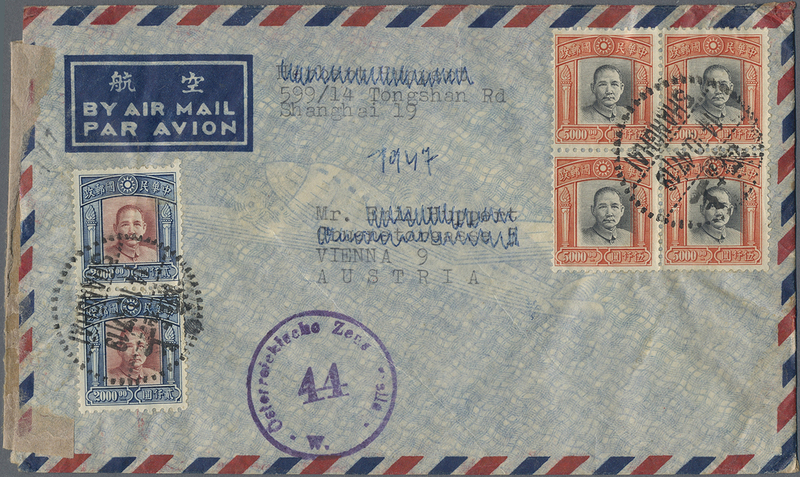 (military) and three covers 1940/41. 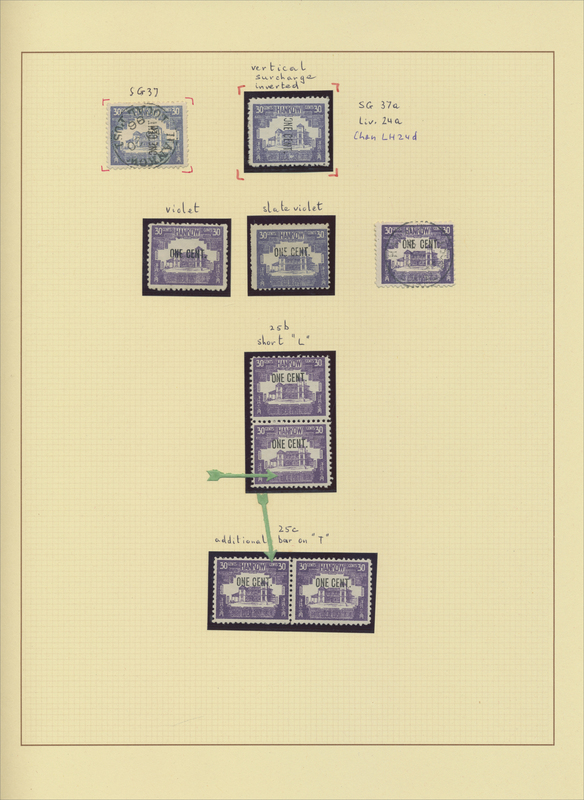 Also 1939 US constitution set MNH in pairs resp. 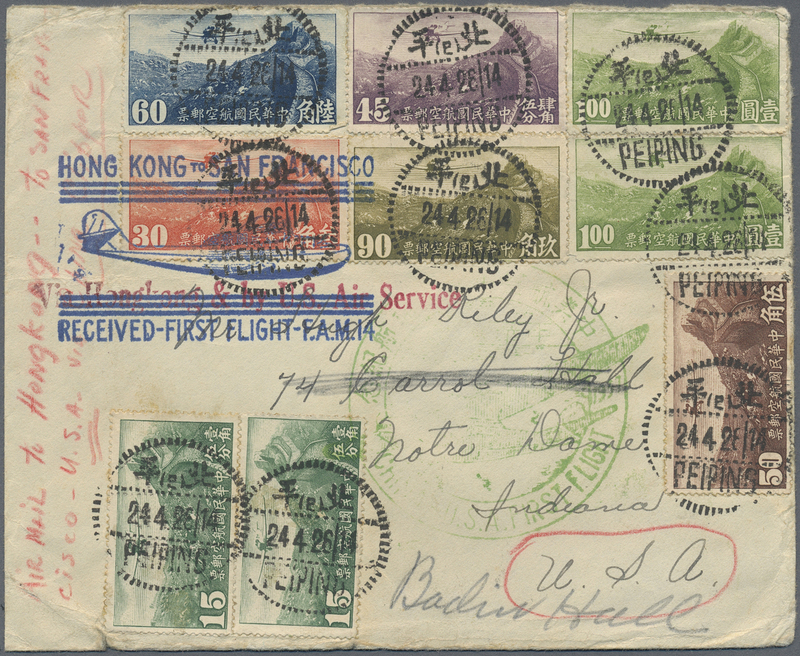 used singles/set cover front to HK. 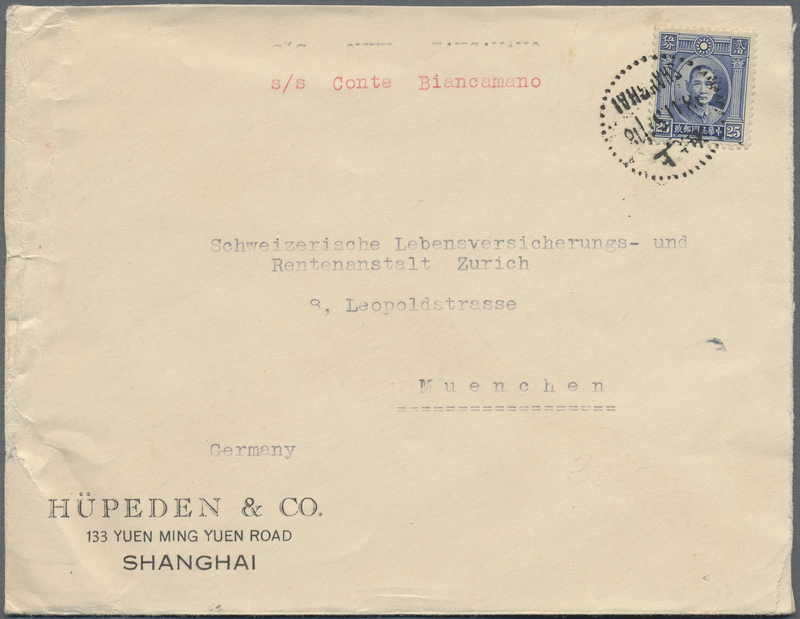 29466 postfrisch (never hinged) ** ungebraucht (hinged) * gestempelt (marked) Briefstück (on piece) 1932/48, comprehensive Sun Yat-sen definitives collection in 2 white folders, from the first De La Rue issue to the Gold Yuan issues and the Hwa Nam Silver Yuan issue. 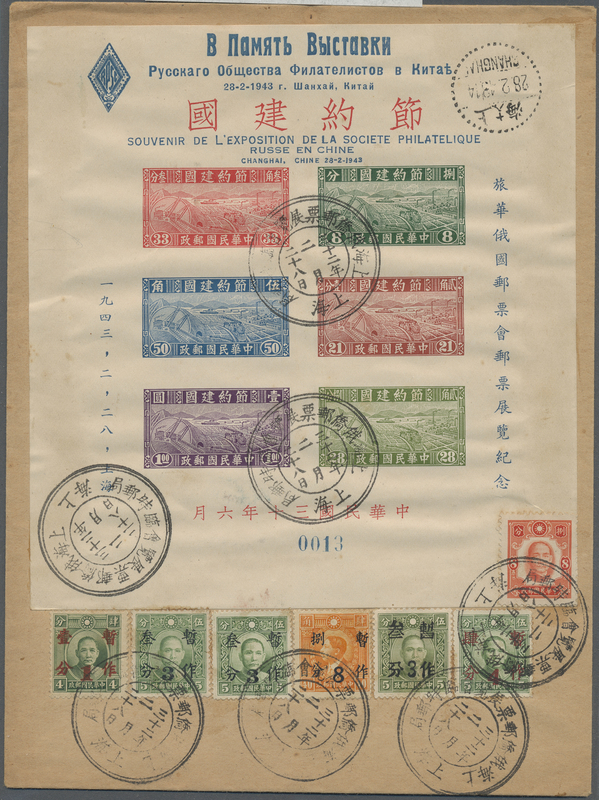 Also including provincial , Japanese Occupation issues, and a few Liberation Area overprints on Sun Yat-sen definitives. highly interesting study. 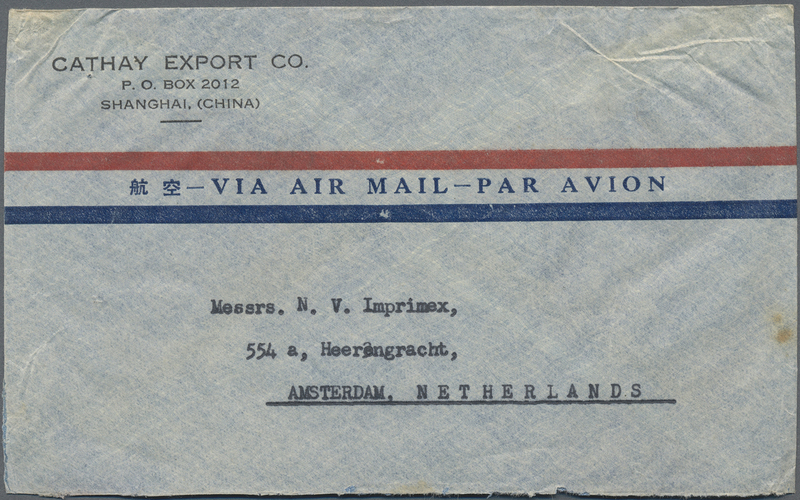 29467 Brief (cover) Flugpostbrief (Flight cover) 1932/49, ca. 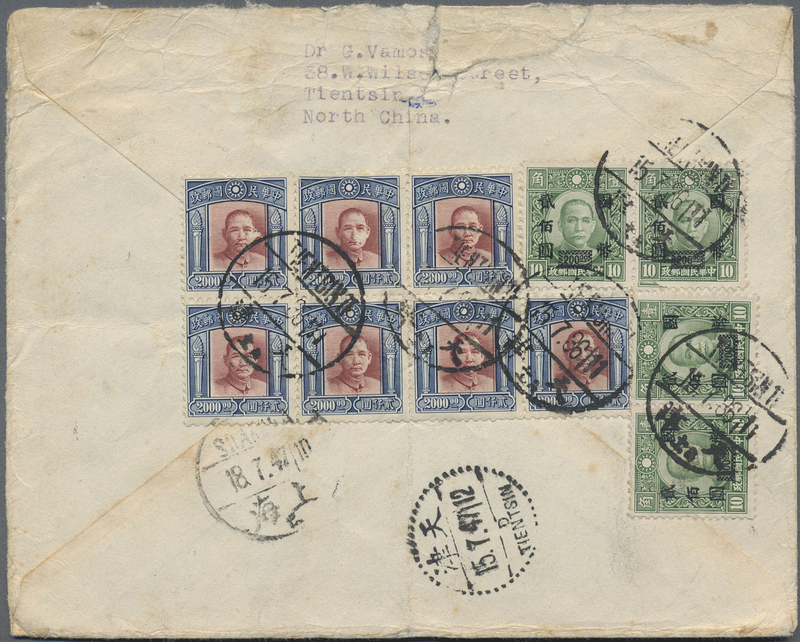 60 covers and postal stationeries of Sun Yat-sen definitives on pages in a white folder, with a few airmails of different rates, and a good coverage on overprints of different periods, a substantial lot with good interests. 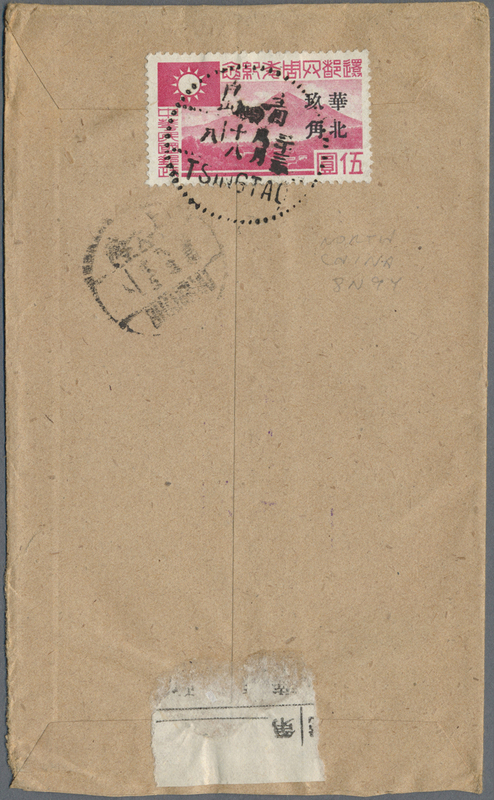 29468 Brief (cover) 463A (6) etc. 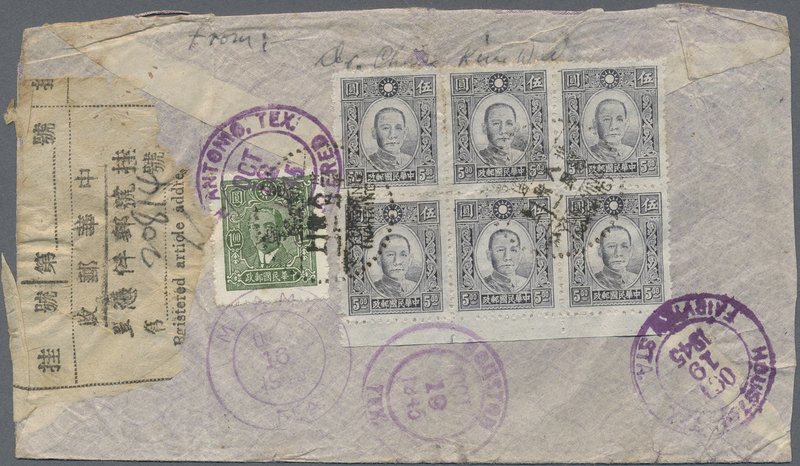 1937/47, covers (6), mostly airmails inc 1937 clipper commercial FFC "PEIPING 24.4.26" to US, 1943 SYS $5 greyish lilac bottom margin block-6 (3x2) used "YUNGPING (NANNING) 34.8.31" to reg. 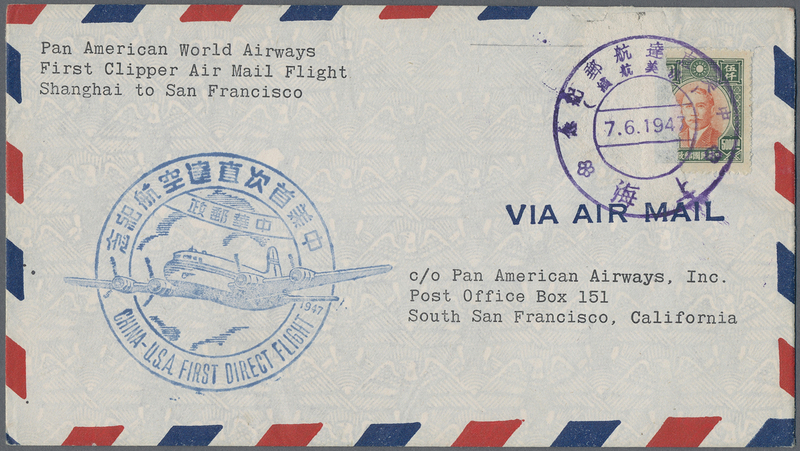 airmail cover to US. 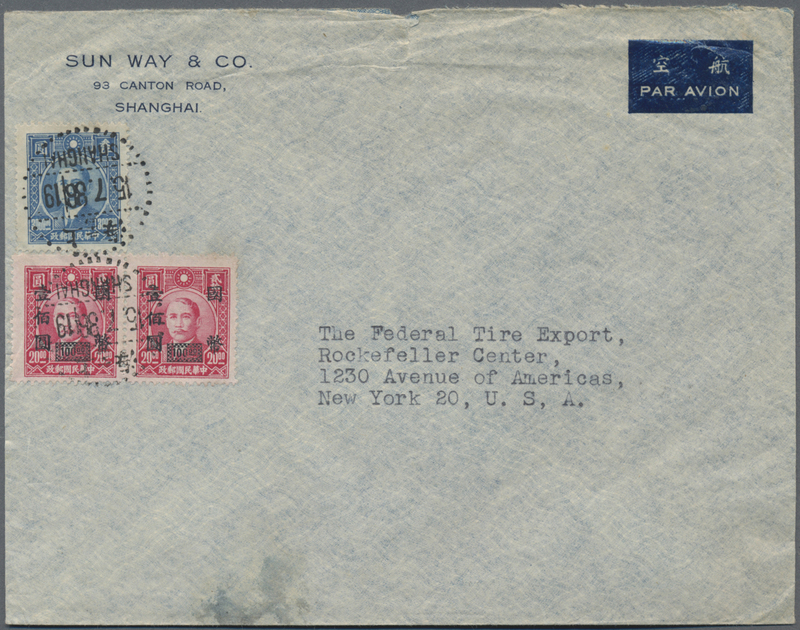 29469 Brief (cover) 1938/46, SYS and martyrs foreign mail covers (5) inc. censorship, non reclamé and small size air mail cover at $1.15 rate "SHANGHAI 21.6.38" via I.A.L. 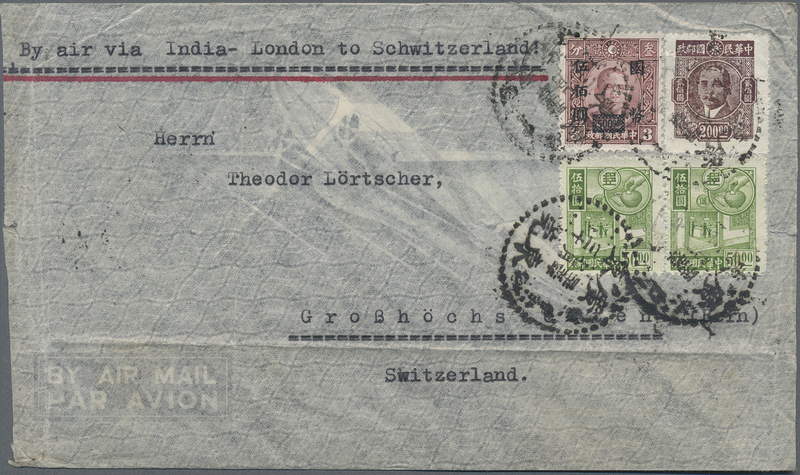 to Germany by "Rajputana". 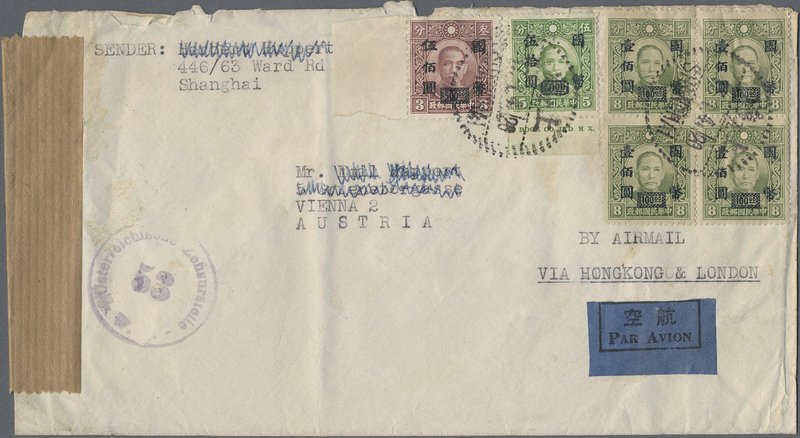 29470 Brief (cover) FDC 1939/84, covers/FDC/cto entires (21) China-Switzerland related, inc. 1939 censored air mail cover $2.50 frank Shanghai via Hong Kong to Zofingen. 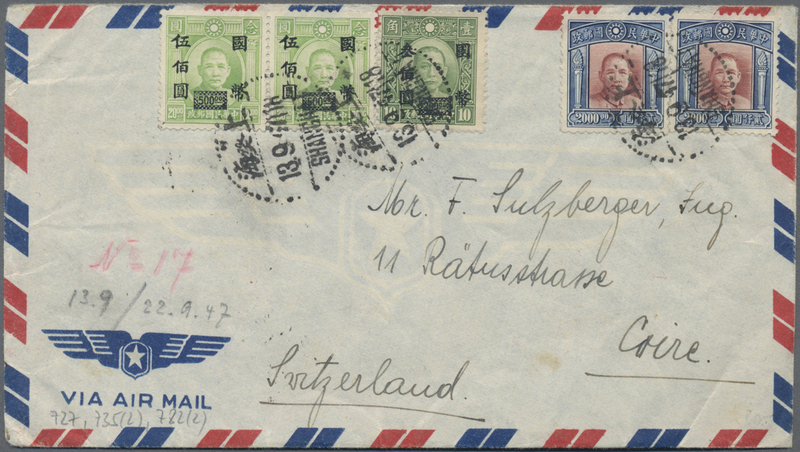 29471 postfrisch (never hinged) ** ungebraucht (hinged) * gestempelt (marked) Brief (cover) 1940/44, collection mostly Sun Yat-sen definitives and provincial surcharges, also include a few commemorative issues with the Thrift Movement m/s and the Russian Philatelic Society in China overprinted m/s on cover, some may be doubtful, sold as is. 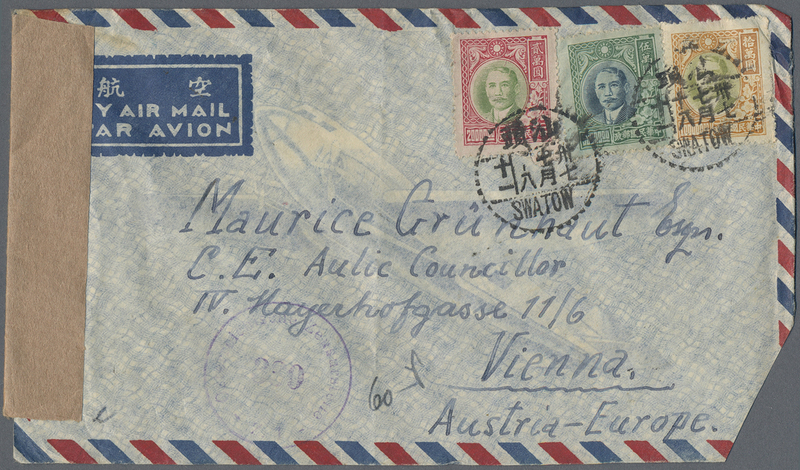 29472 ungebraucht (hinged) * gestempelt (marked) Brief (cover) 1944/49, collection in 2 volumes including Sun Yat-sen definitive issues, surcharges and commemorative issues, mint, used and some on covers, with range of variations, some surcharges may be considered doubtful, sold as is. 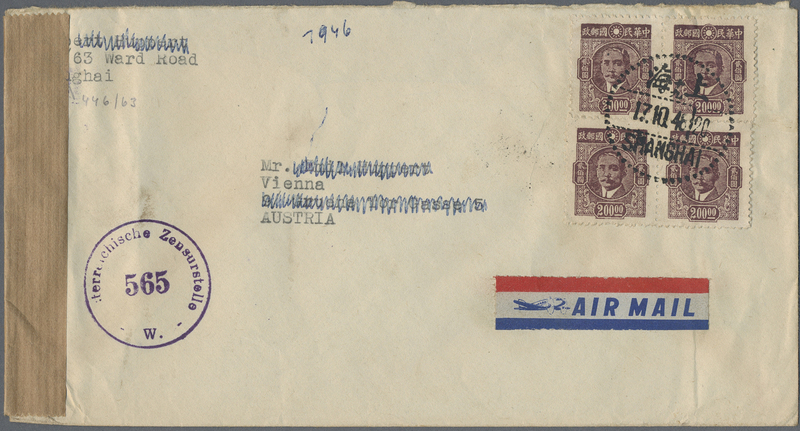 29473 Brief (cover) 1945/47, covers (9 inc. two surface) used to foreign, mostly Austria but also UK, Australia, US. Inc. censorship and registration. 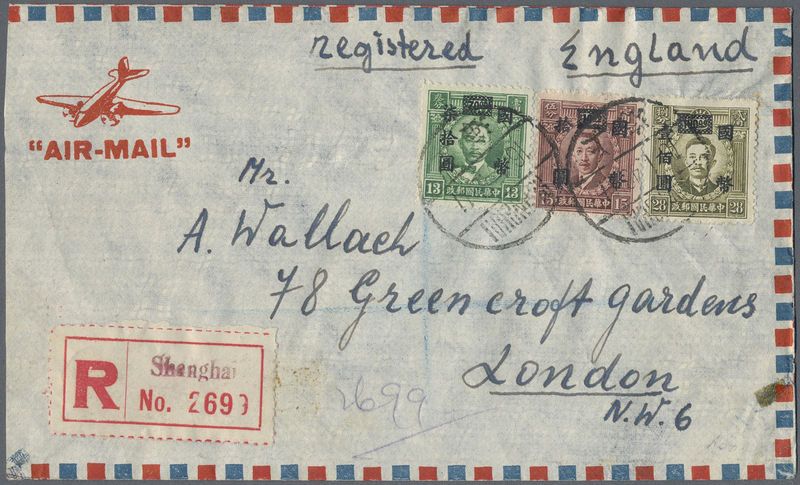 29474 Brief (cover) 1945/48, commemoratives on cover (6) all to USA. 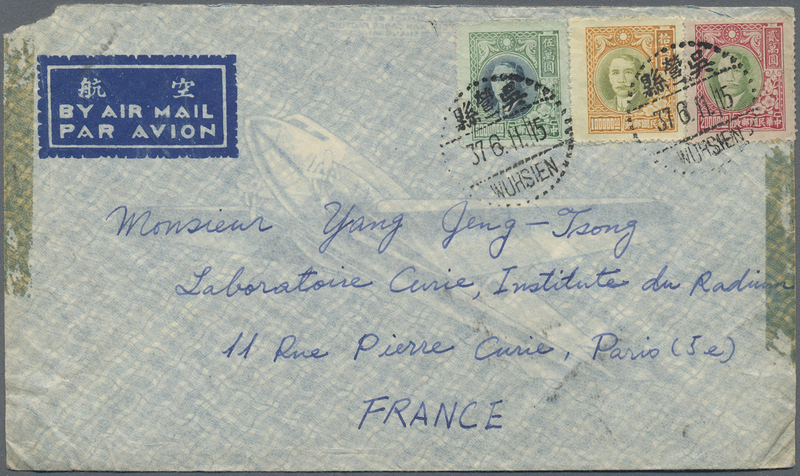 29475 Brief (cover) 1945/49, covers (9) mostly to US, CNC but one 1949.4.22 gold yuan on fiscals cover. 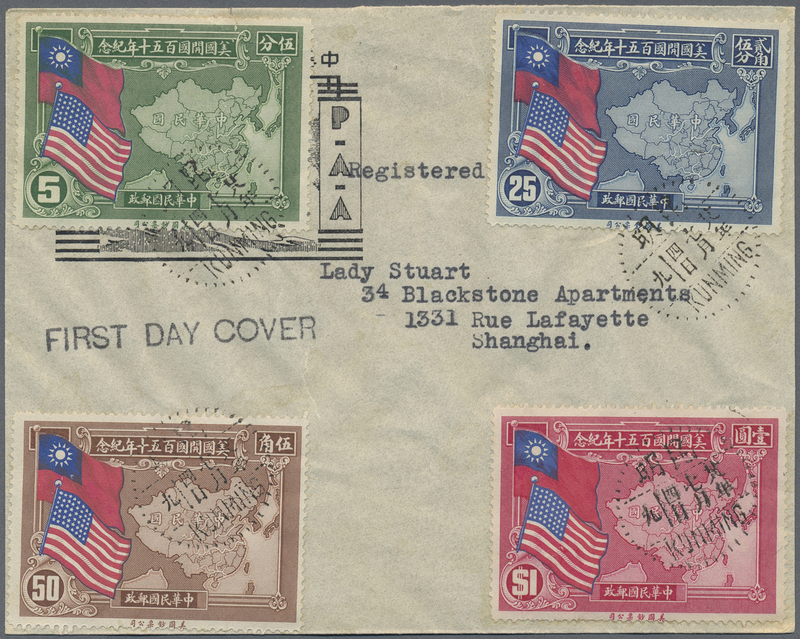 29480 Brief (cover) 1947/48, SYS plum blossom covers (10), one used inland to Shanghai, otherwise to US. 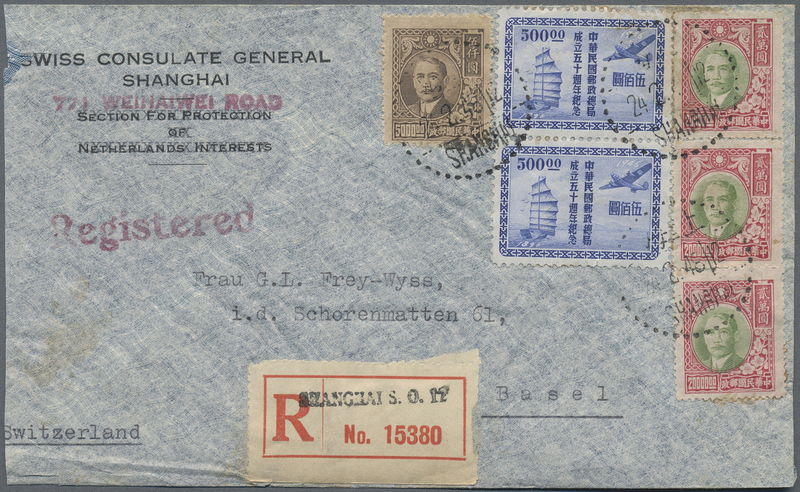 29481 ungebraucht ohne Gummi (unused without gum) (*) gestempelt (marked) Brief (cover) 1948/49, Gold Yuan surcharges on SYS, mint and used specialized collection on 18 pages inc. two covers, great variety, to be inspected. 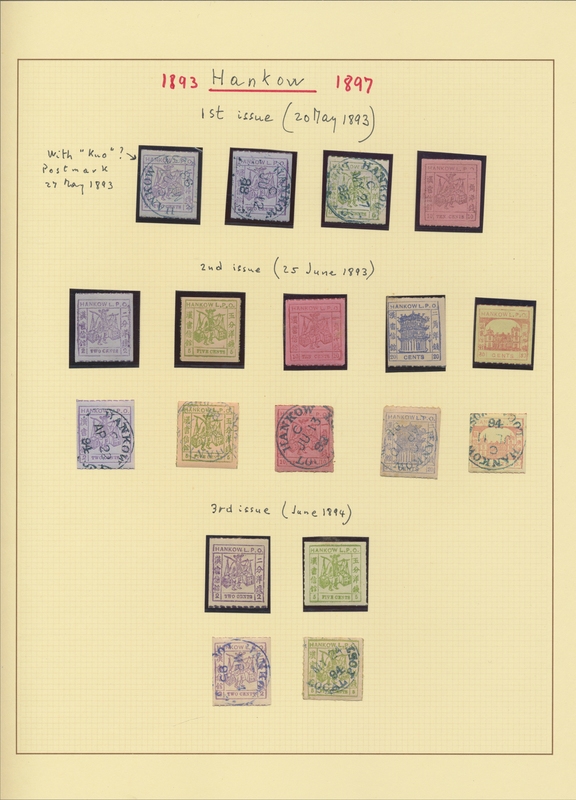 29482 ungebraucht ohne Gummi (unused without gum) (*) gestempelt (marked) 4er (Block) Paar (few) 1949, Gold Yuan surcharges on revenue stamps, mint and used specialized collection on 16 pages inc. four full sheets, several units, mirror prints ec., a labour of love. 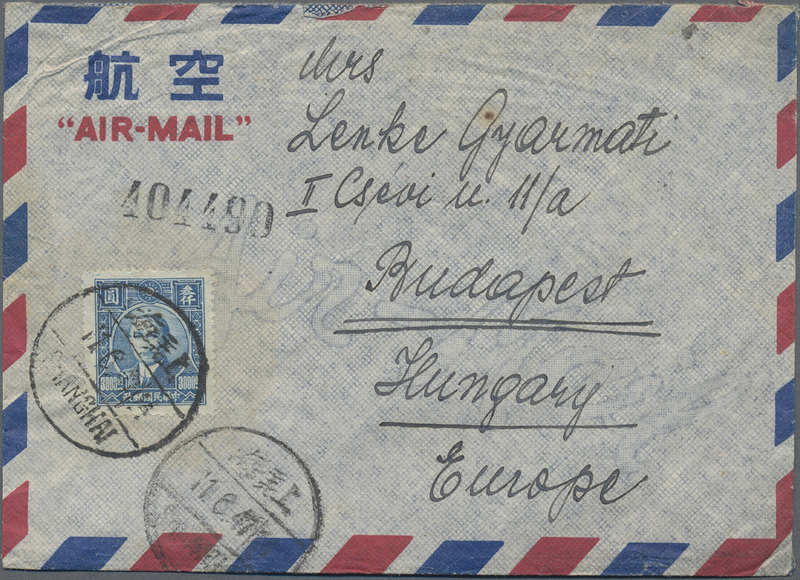 29483 ungebraucht ohne Gummi (unused without gum) (*) gestempelt (marked) Brief (cover) Briefstück (on piece) 1949, silver yuan postal history on pages: perforated mint meter paper with chinese sub-printing; same with 10 C. red meter (2) used Canton Haihoi 1949.5.-; postage fee paid labels (6) of Tung Chun, Yungning, Kiukiang, Canton mint&used, Sinchang identified by 1985 Williams 4th edition catalog; plus cover same Tsing-Shi (Hunan) to Hankow 1949.3.-; use up of gold-yuan in silver yuan period: $100.000x4 1949.4.11 by air Shanghai-HK; unit stamps perf./rouletted, mint and used. 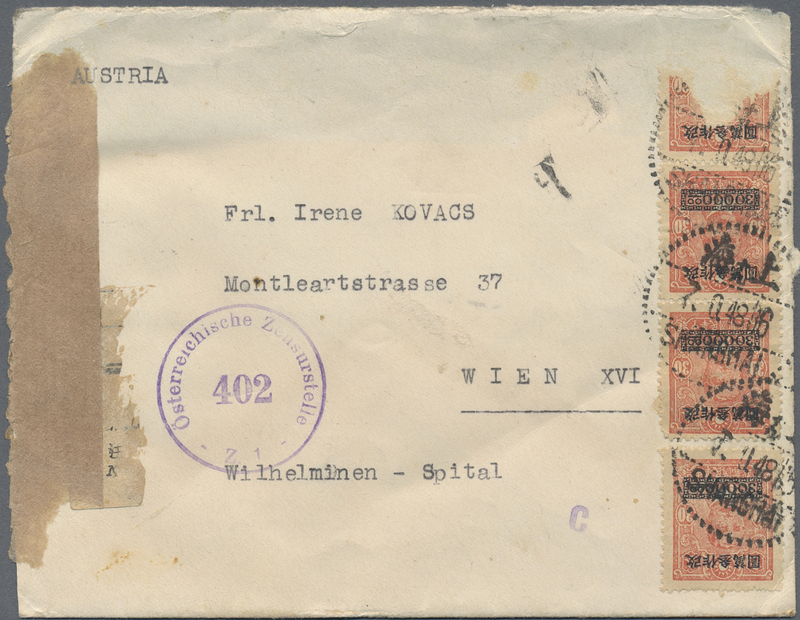 29484 gestempelt (marked) Brief (cover) Briefstück (on piece) 1045U etc. 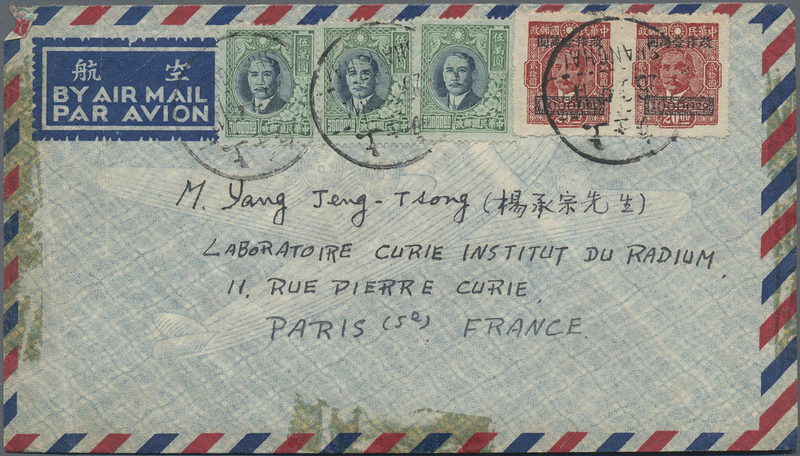 1949, SYS Hwa Nan Silver Yuan issue, 4 C. bluish green, a vertical pair imperforated in-between, used (Chan S24d). 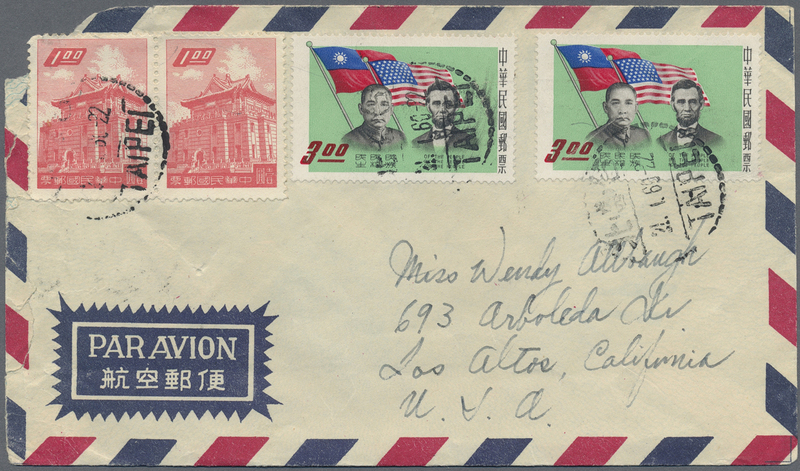 Also regular copy on cover w. 4 C. (3), 2 C. (2) tied "CANTON 38,7.26" to registered cover to Kweilin; and two pieces. 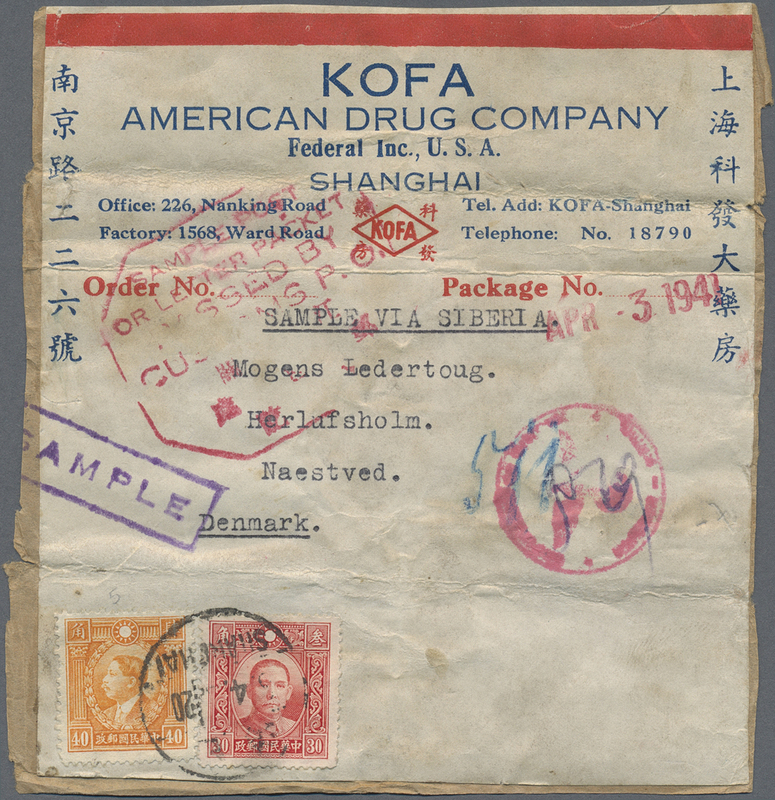 29487 1910/1920 (ca.). 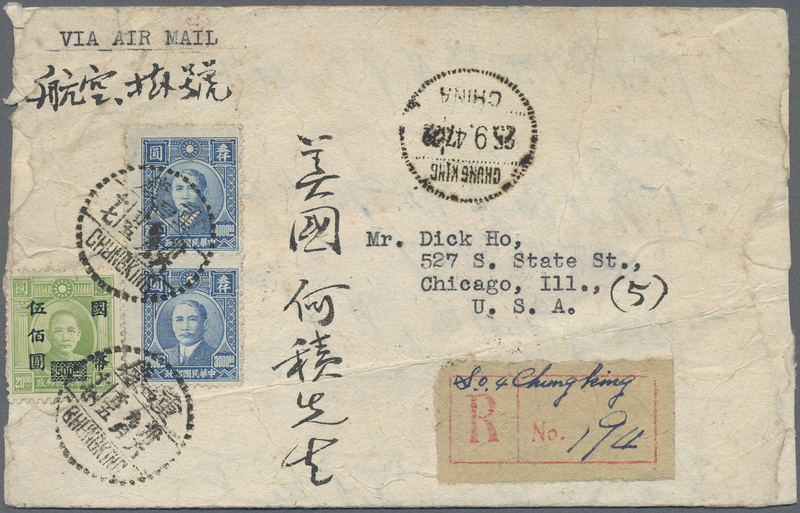 Beautiful collection of these early 20th century issues including used strips and mint with letters of the alphabet in both blue and red, also strips without overprints specifically for the Chinese Post Office and many other better items. An opportunity. 29488 Chan E9 1914. 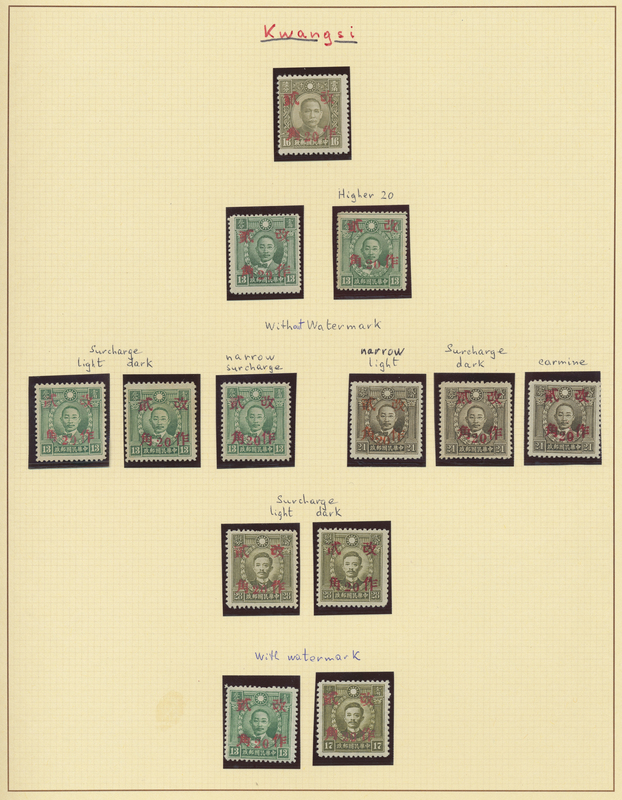 10 c green, 5 parts, green numbers, ABCD in green, Chinese overprint in black: Goose. ÷ 1914. 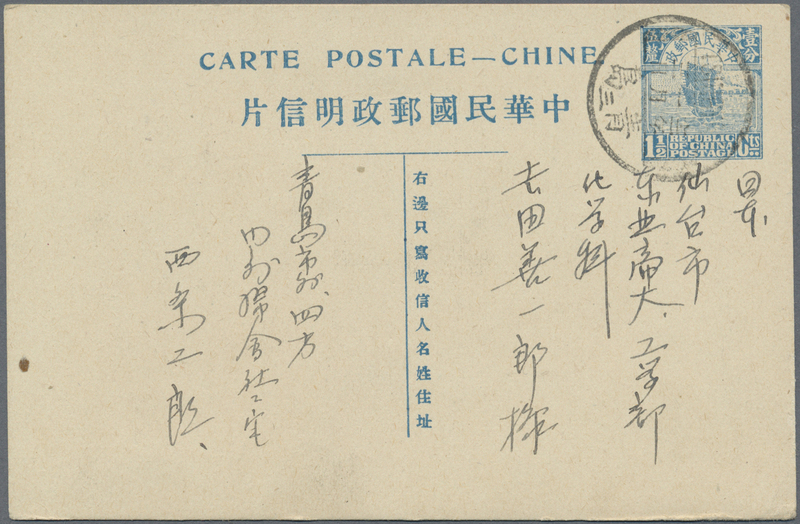 10 c vert, 5 parties, chiffres vert, mention ABCD en vert, surcharge chinoise en noire: Oie. 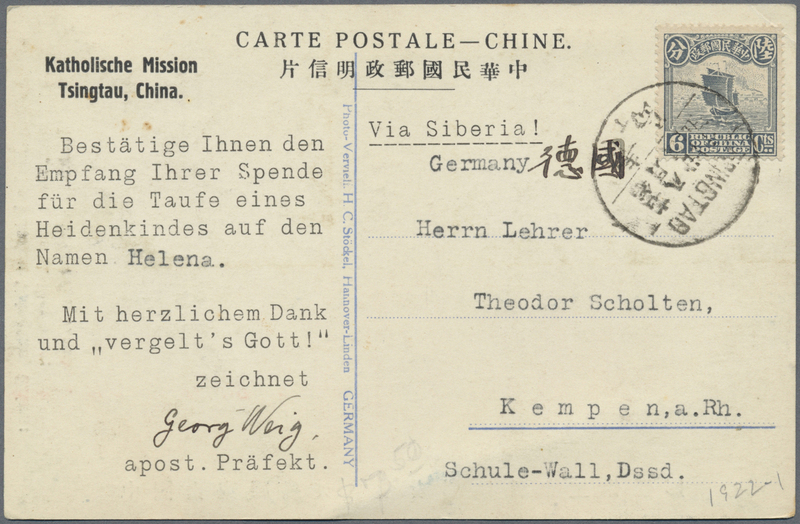 29489 ungebraucht (hinged) * ungebraucht ohne Gummi (unused without gum) (*) gestempelt (marked) Chefoo/Foochow/Nanking/Wuhu, 1893/96, mint and used collection on 26 pages, Chefoo w. stationery mint (6), Foochow inc. mint wrapper and "PAID" on piece, also Ningpo Customs Mail Matter blue strike on piece, Nanking 1 C. and 2 C. design double lining imperforated mint, Wuhu with dues 1 C. with red PPC. 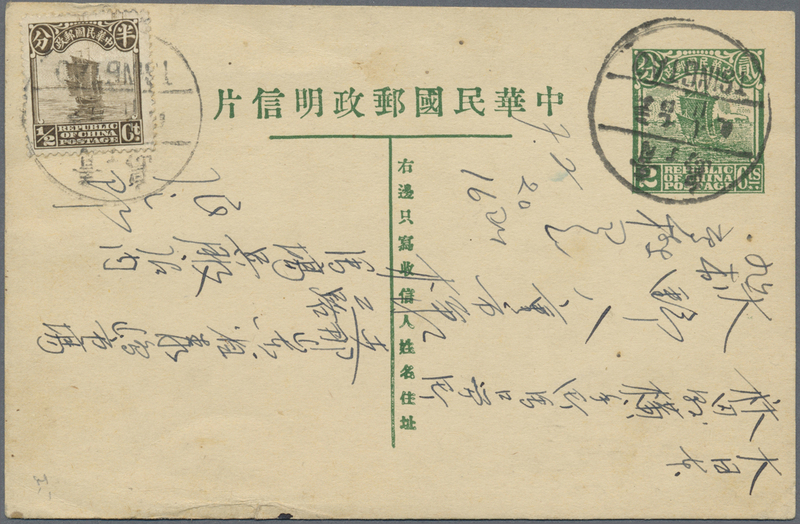 Finally, for reference only, a page with the Shanghai-Amoy-Ningpo and Tientsin bogus issues. 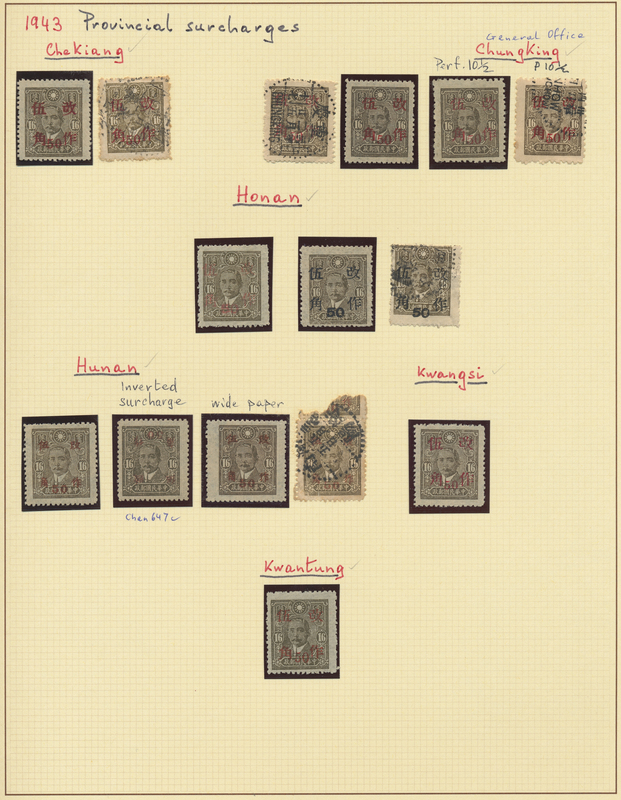 29490 ungebraucht (hinged) * gestempelt (marked) Chungking, 1893, collection mint/used on pages inc. #1 specialized with gutter block-4 and horizontal pairs (8), dues additionally a hand-surcharge set (see note after SG M8). 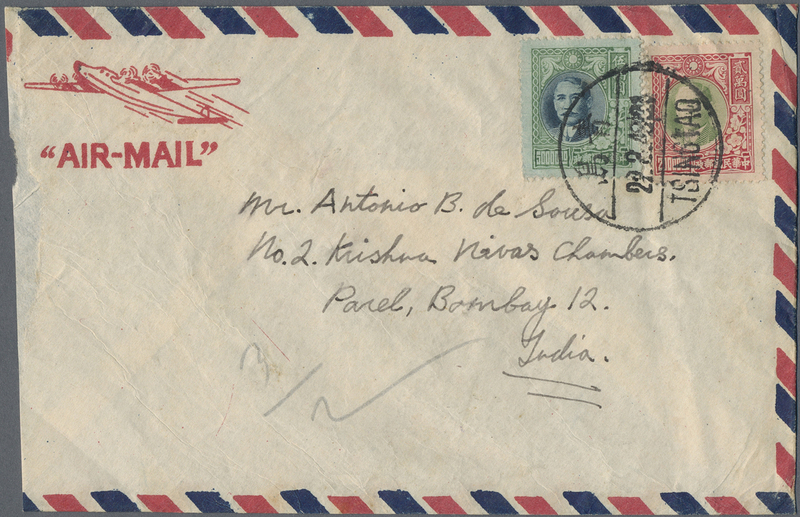 Plus stationery card 2 Ca. 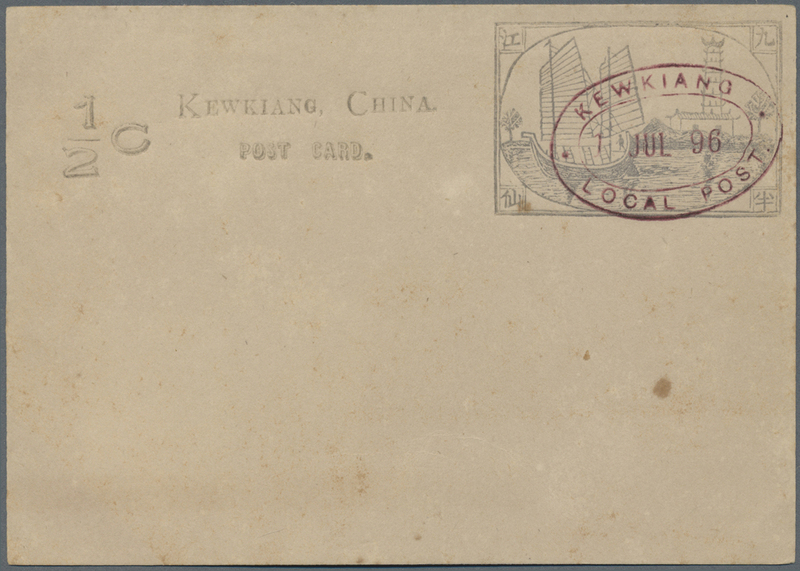 cto "Chungking LPO Shanghai agency 20 AUG 95" and 1 Ca./2 Ca. mint. 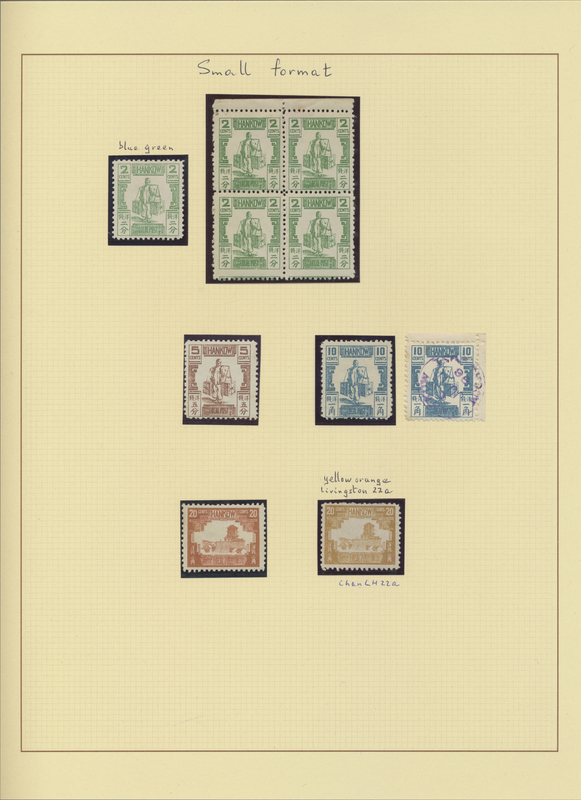 29491 ungebraucht (hinged) * gestempelt (marked) Hankow, 1893/96, mint and used collection on pages inc. varieties 0 C. light blue (Liv. 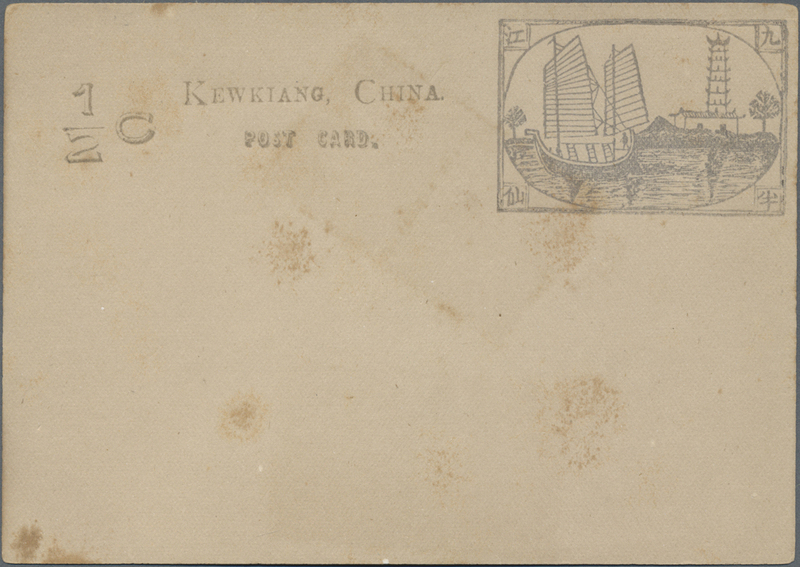 23e), "one cent" surcharge used (SG37) resp. 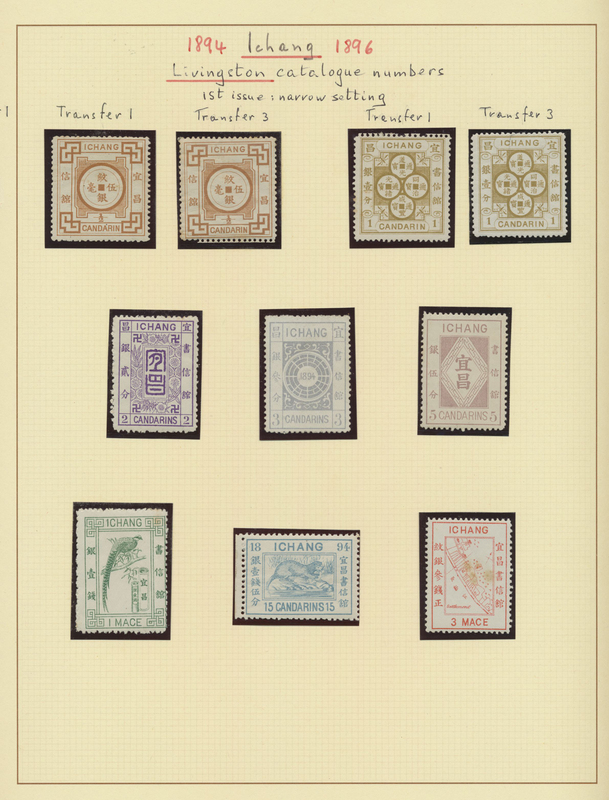 inverted on 30 C. mint (SG 37a, Chan LH24d) and good in dues with #1/5 mint, 12 mint and 13 used (Chan $2900+). 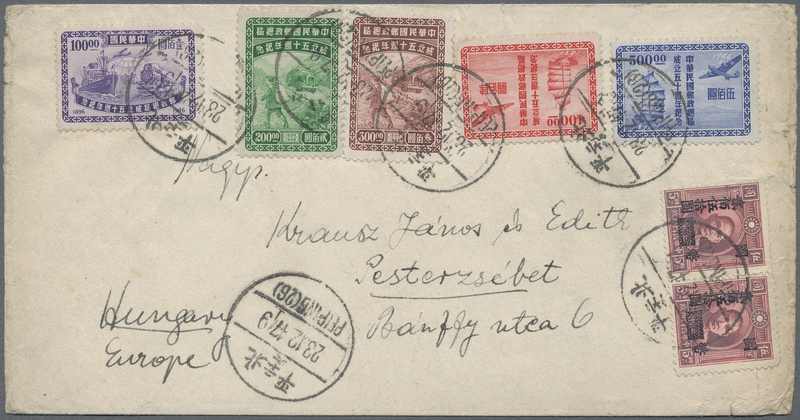 29492 ungebraucht (hinged) * gestempelt (marked) Chinkiang, 1894/96, mint and used collection on pages inc. Chinkiang 1/2 C. pink w. red ovpt. 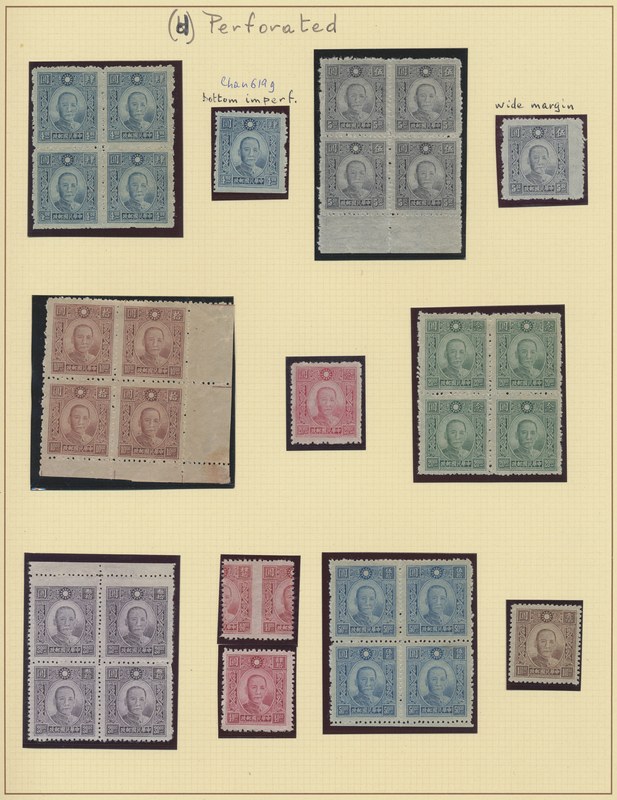 "postage due" (part toning), dues black over red set mint 1 C., 4 C., 5 C. (torn, backed), 10 C. resp. 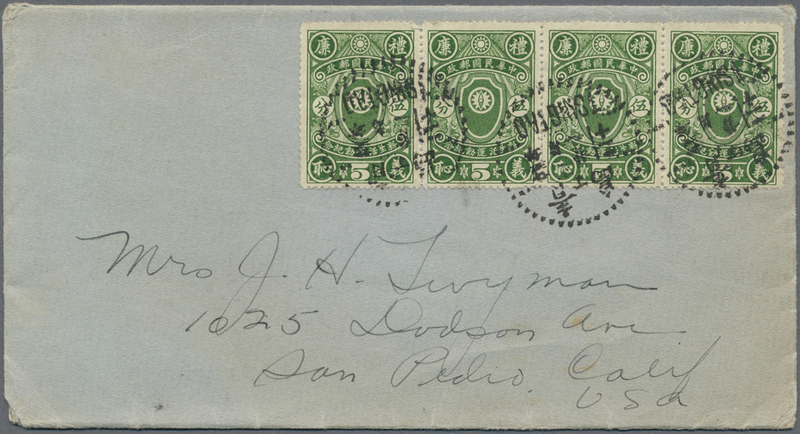 used 6 C., 15 C.Litho due issue stone proof printed both sides, see Livingston after D24. 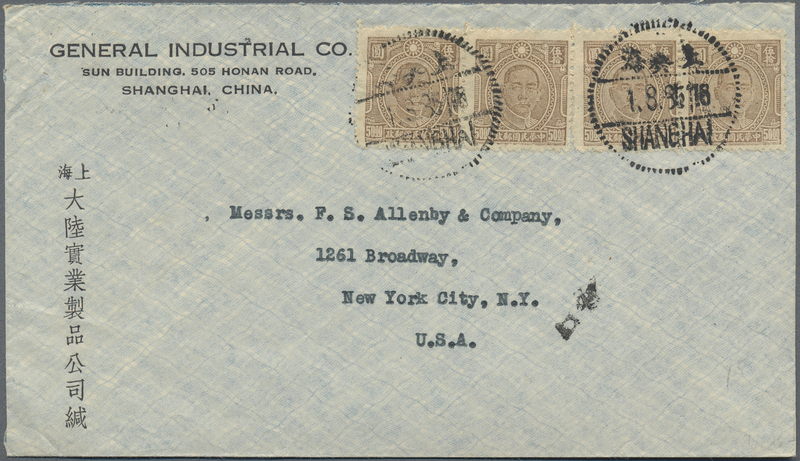 Inc. stationery cards 1 C. brown and blue, mint. 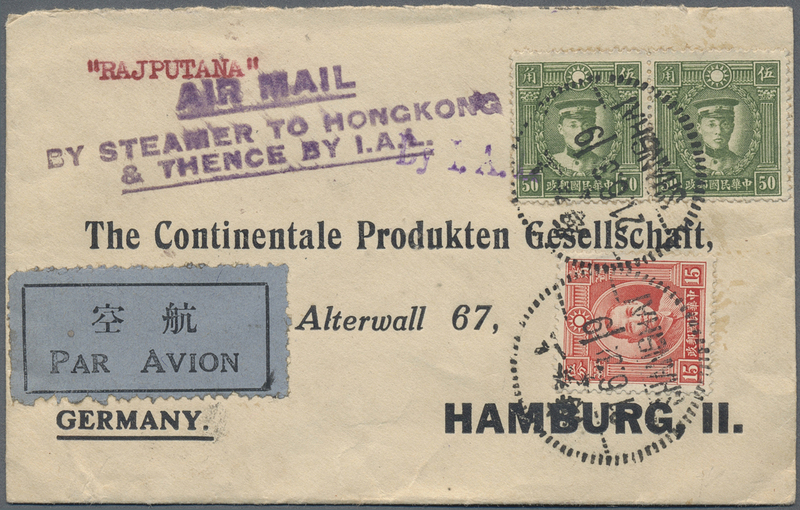 29493 ungebraucht (hinged) * gestempelt (marked) Ichang, 1894, mint and used collection on pages inc. handstamped violet 2 Ca./3 Mace on 1st issued canc. 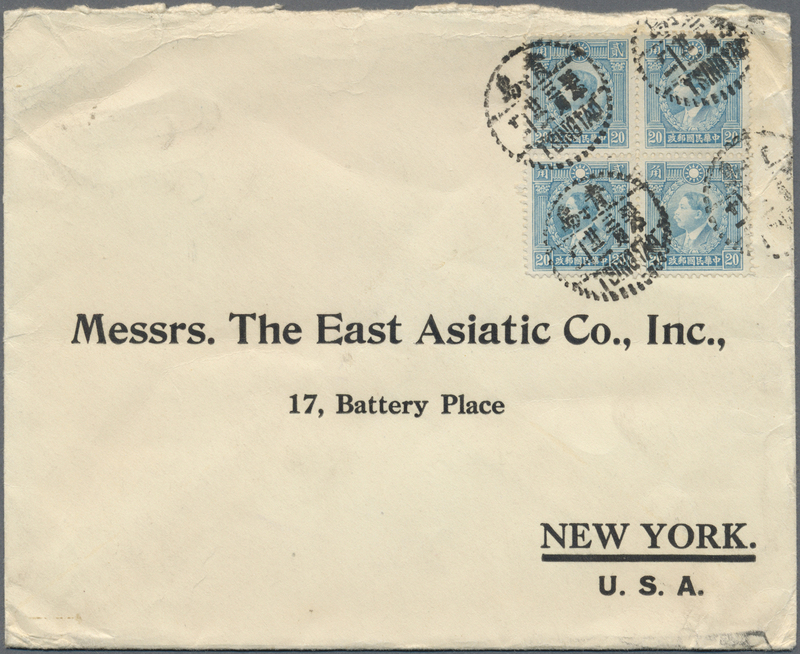 "27 NOV 96" (some stains, Chan LI-15), resp. handstamped in black rouletted and perforated mint. 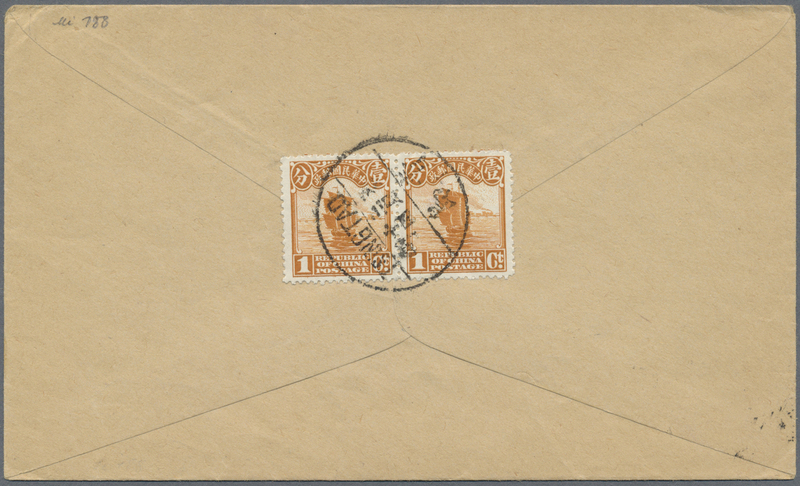 29494 ungebraucht (hinged) * ungebraucht ohne Gummi (unused without gum) (*) gestempelt (marked) Amoy, 1895/96, mint and used collection on pages inc. dues mounted mint, with "Half Cent" ovpt. 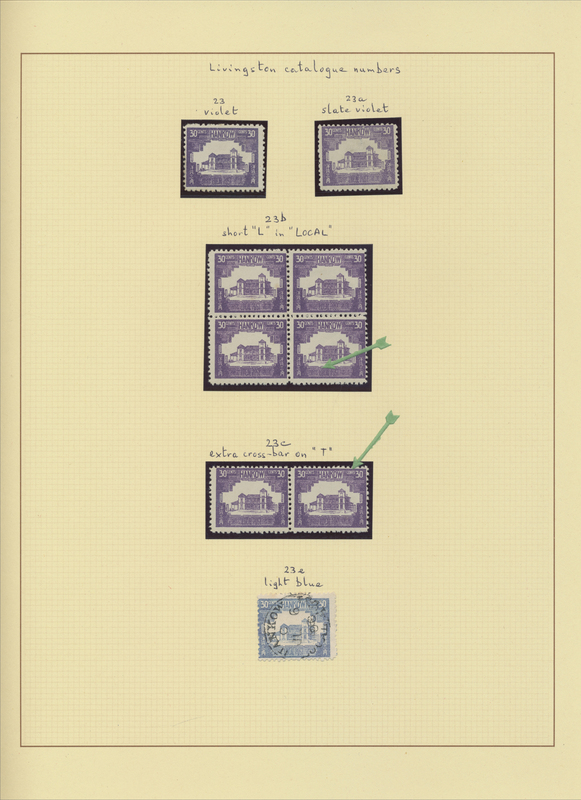 on blanc stamp paper (see Livingstone after #18). 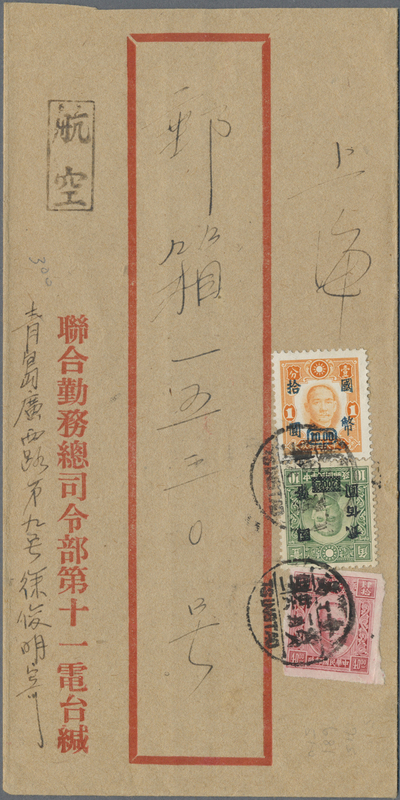 Dues with red surcharge 1/2 C. type II, 2 C. type I (no gum); black surcharge 1 C. type II, 2 C. type III and the 1 C. ovpt. roman capitals in black (Chan LAD12, SG D29). 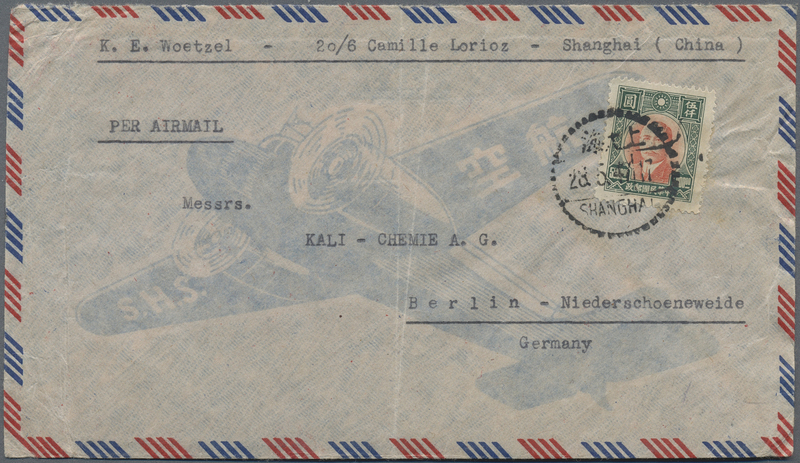 also Shanghai 1/2 C. ovpt. 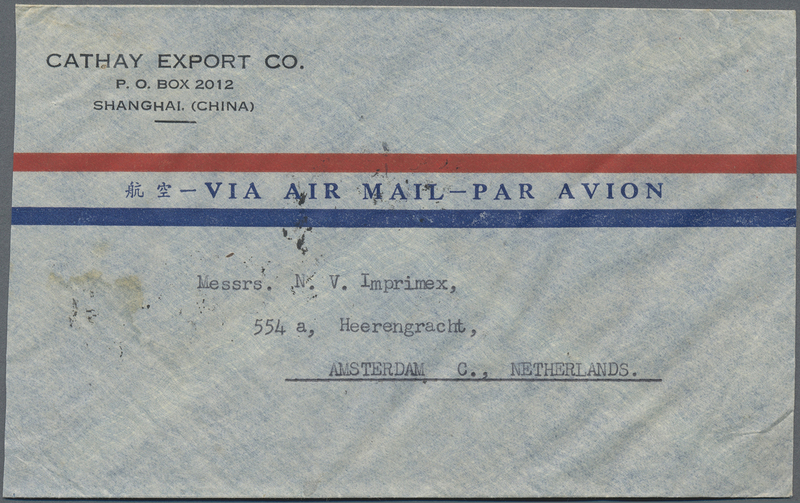 "AMOY / Provisional / HALF / CENT", unused mounted mint, see China clipper Vol. 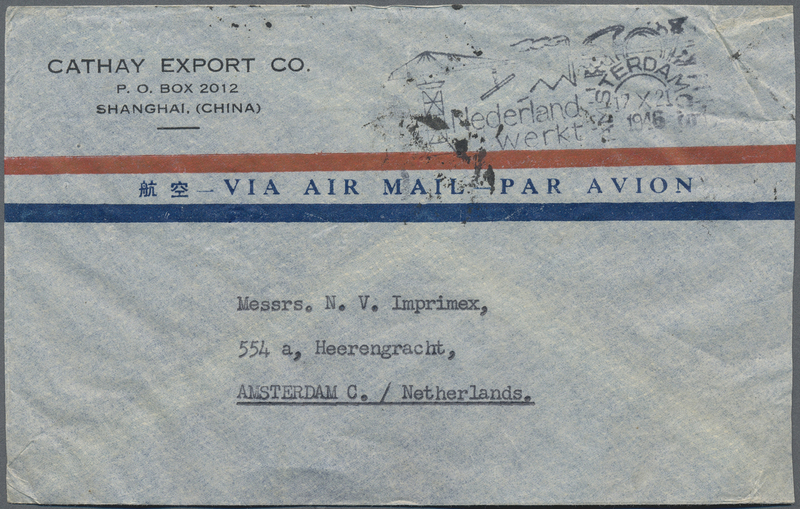 43 p. 156, Dougan Shanghai postal system p. 12 and Livingston p. 23 "Essay". 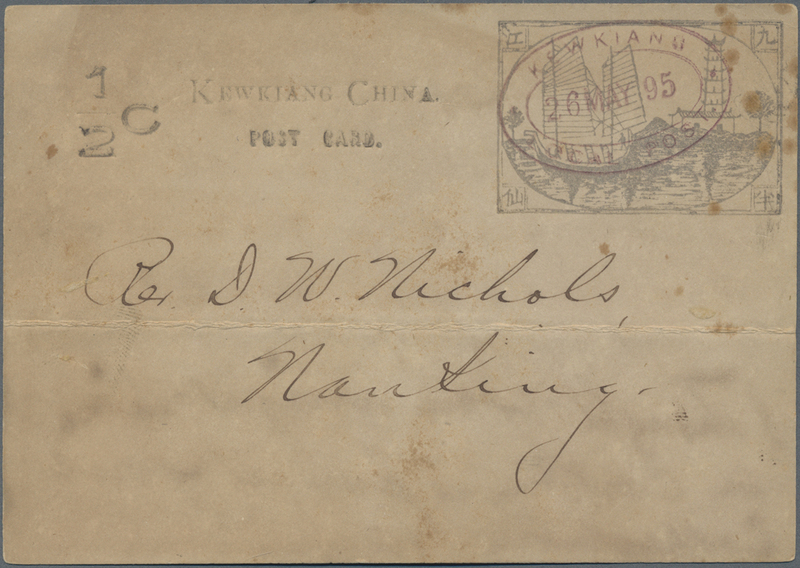 29495 Ganzsache (Complete) Kewkiang, 1896, local post card 1/2 C. (4): used "KEWKIANG 26 MAY 95" to Nanking with long message by two persons (toning and horiz. 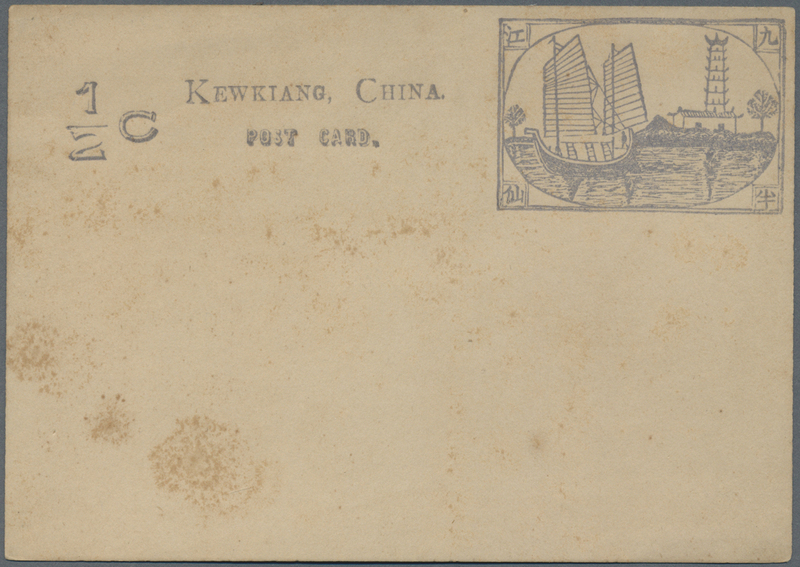 crease); cto 1896 and two mint copies with 14 or 15 mm distance. 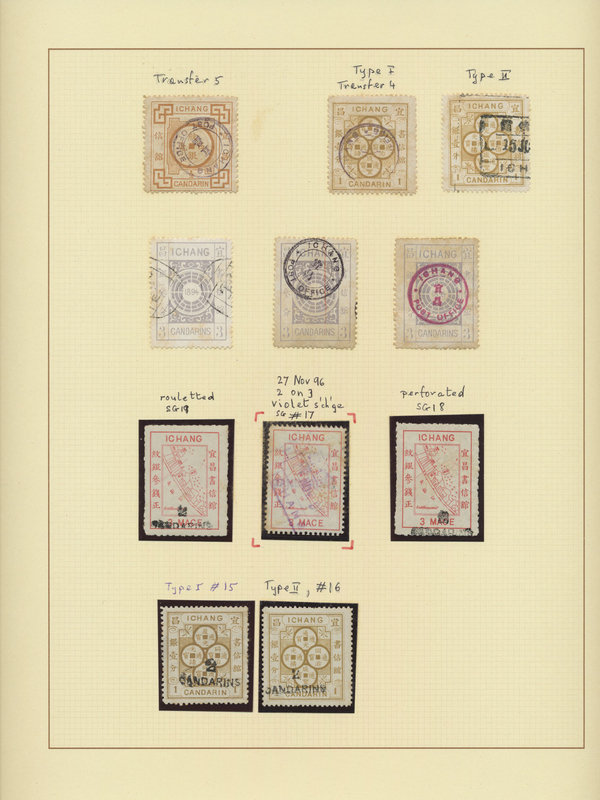 29496 ungebraucht (hinged) * ungebraucht ohne Gummi (unused without gum) (*) gestempelt (marked) Kewkiang, 1896, mint and used somewhat specialized collection on pages inc. 1/2 C. horiz. 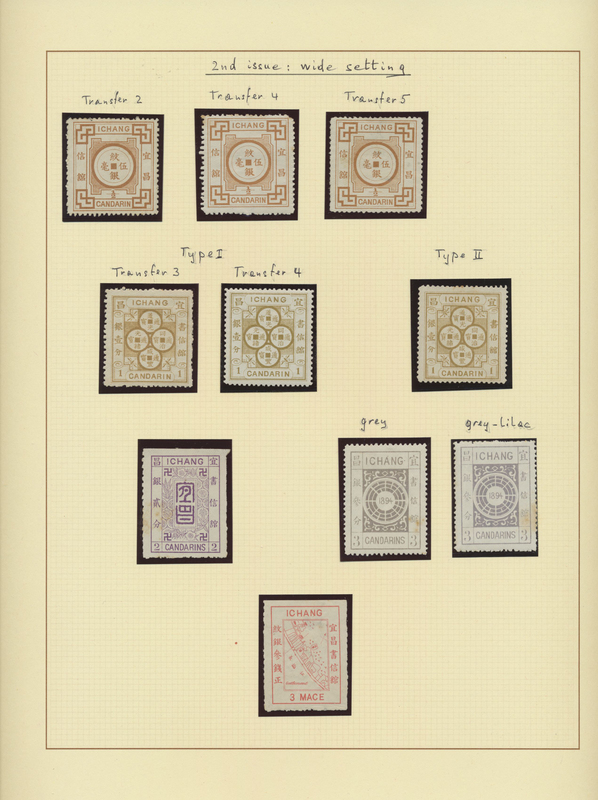 strips 10 (5), 1 C. horiz. strips. 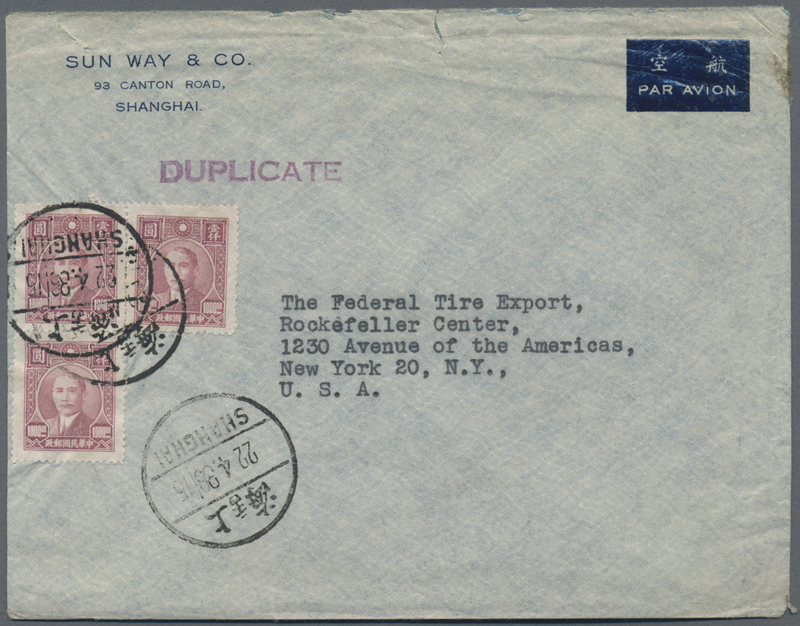 10 (10), 20 C. tied "24 JUL 94" to red band cover to Shanghai, 15 C. red on yellow w. bottom left corner "1" of "15" omitted (Chan LK8a) mint w. slight faults , black surcharge 2 C./ C. (Chan LK16a, Liv 20a), dues red on 1 C. resp. 10 C. (Chan LKD5/6 resp. 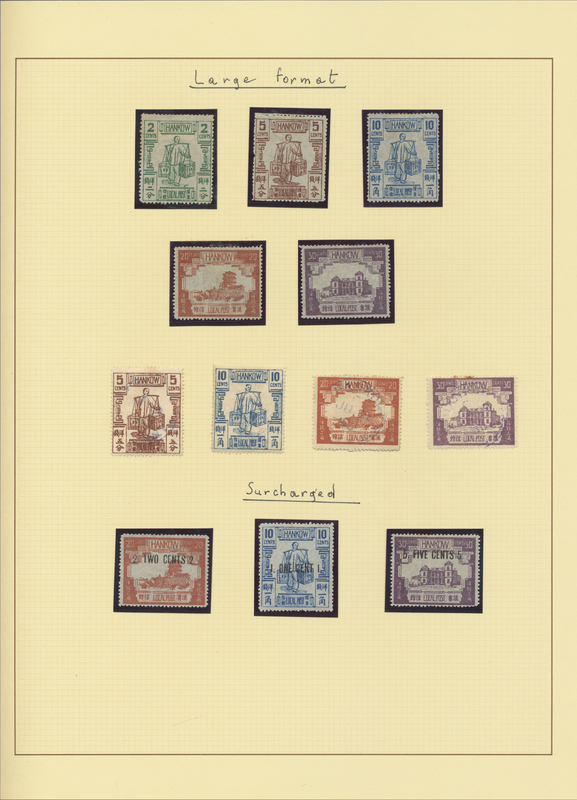 SG D21/22) mint. 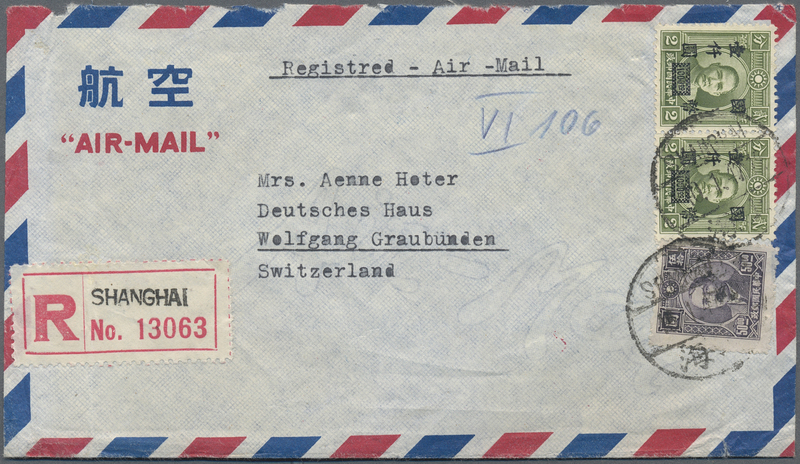 29497 ungebraucht (hinged) * ungebraucht ohne Gummi (unused without gum) (*) gestempelt (marked) 28/31, 32/42 1866/77, small dragon in Cents or Cand., unused no gum (31 inc. two mounted with gum) and used (2) on stockcards (Michel cat. 1578.-).